Product prices and availability are accurate as of 2019-04-22 03:58:36 UTC and are subject to change. Any price and availability information displayed on http://www.amazon.co.uk/ at the time of purchase will apply to the purchase of this product. 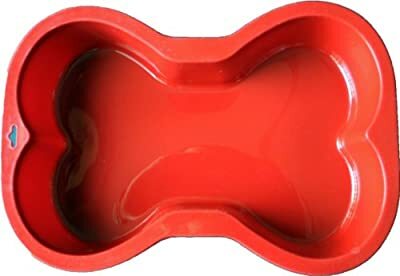 The Bone Shaped K9 Cakery Silicone Cake Pan is a wonderful product to use in the kitchen! Is it your pups birthday? Do you feel like making him/her a treat? Then we believe this cake pan would make a perfect addition to your kitchen! If you're not sure what products or recipes to use, why not check out our recommendations for Quality Dog Foods and Dog Diet Cookbooks? K9 CAKERY-Silicone Cake Pan. This mold is great for baking, gelatin molds, candy making, and ice molds. It features one bone-shaped cavity that measures 6-1/2x9 inches. This package contains one 7x10 inch silicone bone pan. Imported.